Shields vs. Hammer is being billed as the biggest fight in the history of women’s boxing. Is it? 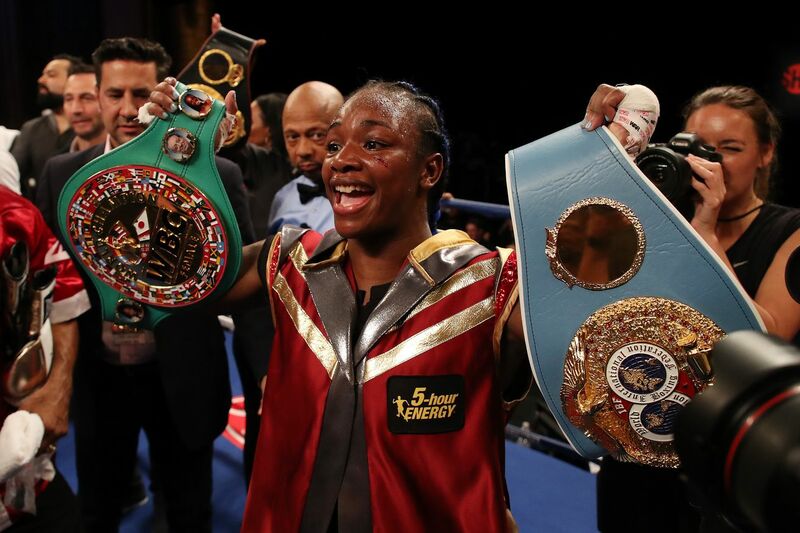 If you believe the hype, Saturday night is the biggest fight in the history of women’s boxing, when Claressa Shields (8-0; 2 KOs) faces Christina Hammer (24-0(1); 10 KOs). Winner will be the unified champion at Middleweight (160 lbs.). Shields vs. Hammer takes place this Saturday, April 13 and airs live on Showtime with a fight time of 9:00 p.m. ET. Three time champ - Shields holds the WBA, WBC, and IBF titles. She won the first of those titles in her 4th pro fight and has been adding to that list ever since. Olympic Gold - Before going pro in 2016, Shields was a decorated amateur. She had a 77-1 record, and represented the US in the Olympics twice, first in London in 2012, then in Rio in 2016. Both times, she went home with the gold. Trash talker - Shields likes to talk. A lot. For many fans, her style of trash-talk can be pretty off-putting, with her constant claims of greatness. There’s a bit of Broner quality there, where the grand statements (she says with a win here she’s the greatest women’s boxer of all time) don’t quite match up with the fighter we always see before us. She’s not always popular as a result, but she is memorable. Lack of power - A 25% KO ratio is just not very good. Women’s boxing is frequently lower on KOs, but the lack of power is a clear issue for Shields, as she hasn’t stopped or dropped an opponent in her last 4. Promotional push - There’s no doubt Shields is the A Side here as far as Showtime is concerned. She’s received a lot of promotional muscle behind her - she was in the first women’s main event on ShoBox, she was part of the first women’s Showtime All Access, and now she’s headlining here. Showtime is hoping she can bring women’s boxing to the forefront. WBO Champ - Hammer holds the one major world title not currently in Shields’s possession: the WBO belt, a belt she has held since 2010. On the road - The German Hammer has fought primarily in her home country, with just one US fight yet to date last June. She acknowledges that this puts her in a tough spot here, as Shields will have to fight the crowd and (unfortunately, but this is boxing) probably the judges. Underdog - At +230, Hammer is the underdog here, but not by too wide of a margin. Still, the pressure is on Shields more, with Hammer getting the opportunity to try and play spoiler. Undefeated? - While Hammer’s record stands at 24-0 with 1 NC, that No Content deserves a closer look. In that fight, Hammer was dropped and took far more than 10 seconds to regain her fight. But the referee ruled the punch an illegal rabbit punch and ultimately gave Hammer the DQ win in what was a highly criticized call. That DQ was eventually overturned to become a NC, but no rematch has ever taken place. Reach advantage - Hammer will have a 3” reach advantage here - 71” to 68”. That’s often a key to her victory as she likes to use the jab to keep opponents on the outside. Otto Wallin (20-0; 13 KO) vs. Nick Kisner (21-4-1; 6 KO) - Another Heavyweight showcase, this time for the Swedish fighter Wallin, competing outside of Europe for the first time. If you like Heavyweight up and comers, this is a good card for you. Most of the talk of this fight has been about its place in the history of women’s boxing, not really the fight itself, and that’s understandable based on how it’s been hyped. So is it the biggest women’s boxing match ever, and will the winner here be the greatest? Well, maybe. But that’s because the bar is pretty low. Women’s boxing is yet to get their Ronda Rousey (or even their Cris Cyborg), and that’s not happening here. Best case scenario is that Shields could maybe become boxing’s Gina Carano - the woman who begins to pave the way for the eventual Rousey. But I’m not confident she even has that degree of appeal. To keep the MMA metaphor going, this feels like, oh, Sarah Kaufman vs. Marloes Coenen circa 2010. Which is not bad, even if it’s not THE GREATEST EVER.